1. A person using IMAP may have sensitive email they’d prefer having stored only on their own computer. If your email account is compromised, email stored on the servers is accessible to the hackers. 2. IMAP users may use On My Mac mailboxes to prevent running out of email storage on the servers. 2. 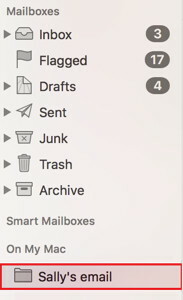 Reading the menus across the Toolbar from the Apple, click on the Mailbox menu. 3. 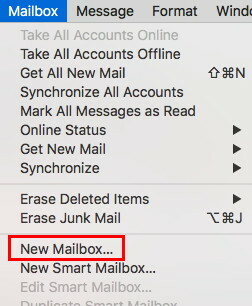 Select New Mailbox… from the menu. 4. In the Location choice, choose On My Mac. 5. Give your new mailbox a name. Consider specific names according to the kind of email you most often archive, by subject or correspondent. 6. IMAP mail in the Inbox is stored on the email server. To get it off the server, simply drag the desired email(s) from the desktop Inbox into one of the On My Mac mailboxes you have set up. 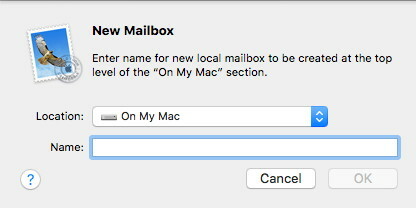 The screenshot below shows where to look for the On My Mac mailboxes. In this example, an On My Mac mailbox has been set up to save email from Sally who sends a barrage of email every day. Select all the email from Sally in the Inbox and drag it to the new On My Mac mailbox named Sally’s email.